Michel Corboz reçoit une première formation au Conservatoire de Fribourg (Suisse), où il étudie le chant, la composition, puis la direction. Sa connaissance et son amour de la voix le conduisent à diriger des œuvres inspirées par elle : chœurs a cappella, cantates, oratorios, opéras baroques. Après avoir fréquenté longuement Monteverdi, Vivaldi et Bach, il se tourne avec bonheur vers les grands oratorios classiques et romantiques. Il fonde en 1961 l’Ensemble Vocal de Lausanne groupe de chanteurs choisis. Les distinctions et l’accueil de la presse pour ses enregistrements du Vespro et de l’Orfeo de Monteverdi, en 1965 et 1966, marquent le début de sa carrière internationale. Depuis 1969, il est chef titulaire du Chœur Gulbenkian à Lisbonne, avec lequel il explore le répertoire symphonique. Il a enseigné la direction chorale au Conservatoire de Genève pendant plus de vingt-cinq ans. La République française l’honore du titre de Commandeur de l’Ordre des Arts et Lettres. Il est fait Grand-Croix de l’Ordre de l’Infant Don Henrique par le Président de la République portugaise en 1999. Le Grand Prix de la Fondation Vaudoise lui est décerné en 1990 et le prix de la Ville de Lausanne en 2003. He founded the Ensemble Vocal de Lausanne, a group of singers chosen in 1961. This building will become the instrument of its success. The countless awards and the enthusiastic welcome of the press for his recordings of Vespro and Monteverdi's Orfeo, in 1965 and 1966, marked the beginning of his international career, which has continued to grow. He recently performed with the Ensemble Vocal de Lausanne a concert tour in Japan. Since 1969, it is titular head of the chorus Gulbekian in Lisbon, with whom he explored the symphonic repertoire. These two formations are closely linked to his professional career. With one or the other he has done most of its records, more than a hundred repeatedly crowned by the Academies of various countries. From 1976 to 2004, he taught choral conducting at the Conservatory of Music in Higher Geneva. He directs the opera willingly Preclassic (Cavalli, Monteverdi, Charpentier), but it is mainly the concert repertoire for chorus, orchestra and soloist, he performs around the world and records. His discography has many recordings for Erato, and Cascavelle Aria Music, repeatedly awarded the disc. Today, many of them are republished at Warner and Virgin. Among his greatest achievements are the Bach Passions, the Mass in C minor by Mozart, Mendelssohn Elias, the Missa di Gloria by Puccini and Mozart's Requiem, Verdi, Fauré and Brahms. In his catalogue also works by Swiss composers such as Martin or Honegger and, in creation, the Vespers to the Jesuits of Marc-Antoine Charpentier. He registered with the Missa Erato Sacra Schumann. 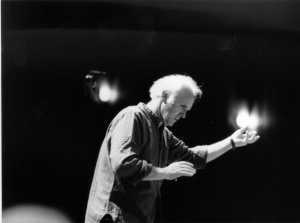 Michel Corboz has been awarded Critics during his first two tours in Argentina, in 1995 and 1996. The French Republic has been honoured with the title of Commandeur de l'Ordre des Arts et Lettres. He was awarded the Order of the Infante Don Henrique by the President of the Portuguese Republic in 1999. The Grand Prix de la Ville de Lausanne has been awarded in 1990 and 2003.